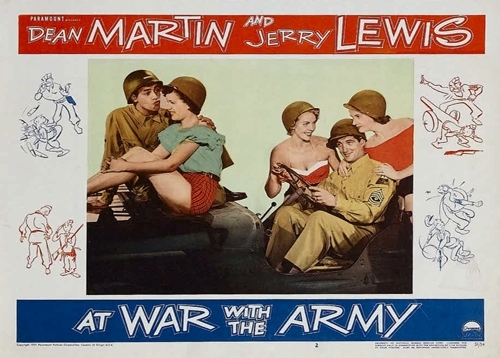 After appearing in a couple of movies as supporting players, Dean Martin and Jerry Lewis got their first starring roles in AT WAR WITH THE ARMY.It was the first of many triumphs for what would become one of the most successful comedy teams in show biz history. Director Hal Walker had helmed several of the Hope & Crosby “road” pictures so he had plenty of experience in dealing with comedy teams. Overall, this movie is a light and entertaining comedy, probably much like seeing the pair do their nightclub routine but framed in an army setting.It features several terrific and memorable songs including "The Army Gets the Beans." WRITER: James B. Allardice, et.al.